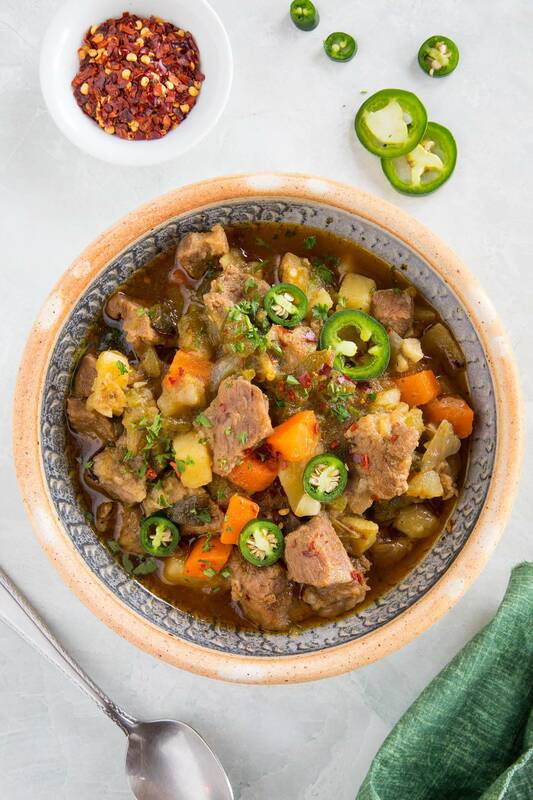 A recipe for green chili stew made with a variety of roasted green chili peppers, loads of seasonings, and cubed pork shoulder, simmered low and slow until perfect. It’s time for some stew, my friends! But not just ANY stew. 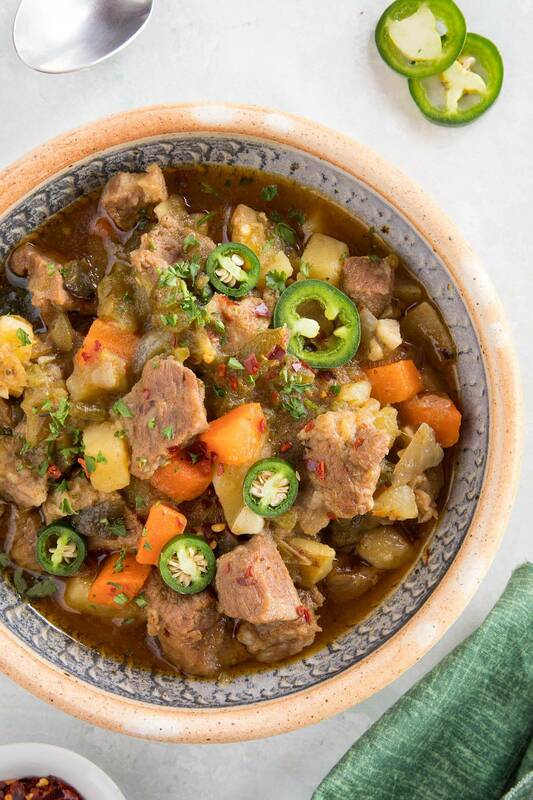 Today we’re cooking up a super flavorful, beautiful pot of green chili stew that is going to become one of your new favorite recipes. 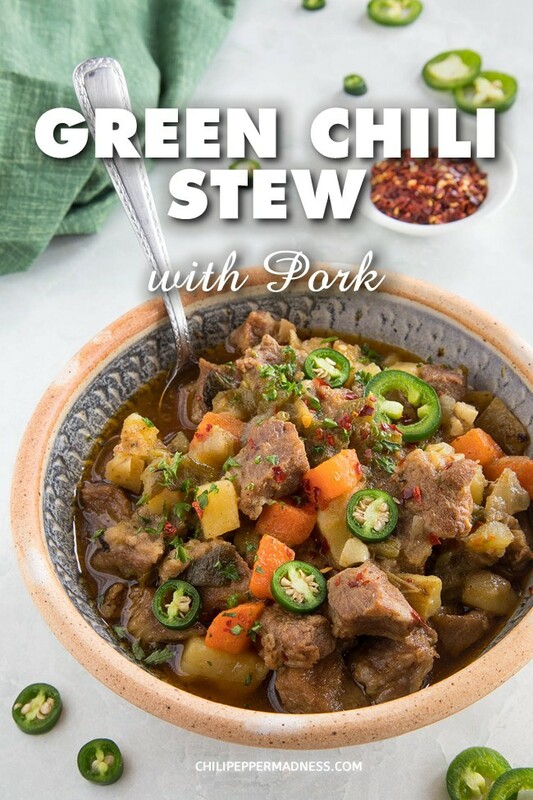 This stew is loaded with flavor, filled with a nice variety of green chili peppers that you’ll roast until nice and tender. It’s also got some wonderful seasonings, as well as pork shoulder that becomes fall-apart tender as it cooks low and slow in the pot, letting all those flavors meld together. There is nothing more wonderful, or maddening at times, than a pot of aromatic stew simmering away on the stove top, wafting through the house, driving you crazy with desire. It might be tough to wait! But wait, you must. The great thing about this recipe is that it can be made with your choice of green chili peppers, so consider which ones you’d like to cook with beforehand, then schedule it up! A variety of peppers with different heat levels will give a more balanced stew. I used green bell, cubanelles, jalapenos, and serrano peppers. Others to consider are Hatch chili peppers, Anaheims, or poblanos. There are many different options. Let’s talk about how we make it, shall we? 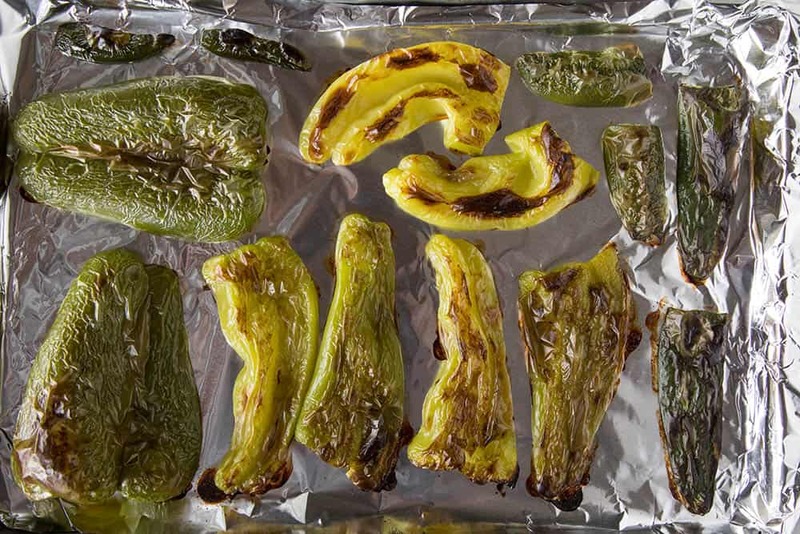 First, slice your chosen green chili peppers in half lengthwise and set them onto a baking sheet. Bake them at 400 degrees F for 20 minutes, or until their skins blister up. Learn more about how to roast chili peppers. Cool them slightly, then peel off the skins and discard them. Chop the roasted peppers and set them aside. While the peppers are roasting, toss the chopped pork shoulder with 2 tablespoon olive oil, chili powder, paprika, cumin and salt and pepper. Heat a large pot to medium heat. Add the pork shoulder and brown the pieces on each side, about 5 minutes. 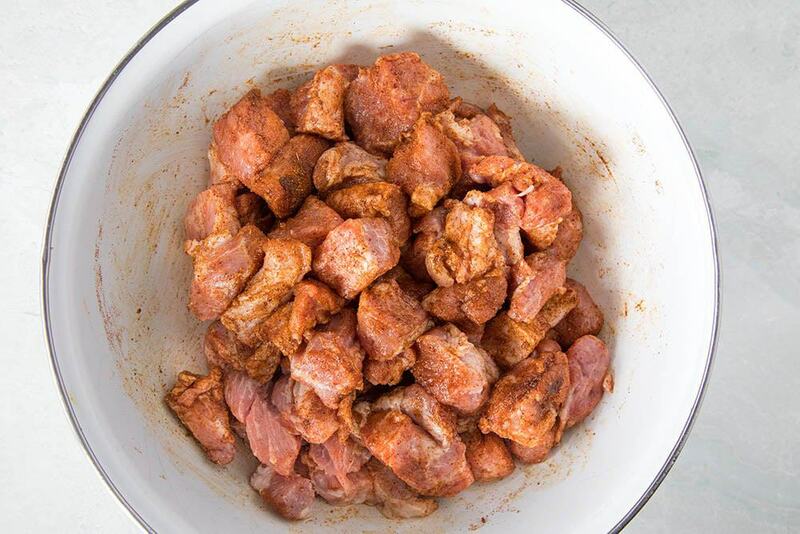 Scoop the browned pork shoulder into a bowl and set aside. In the same pot, add the onion and cook for 5 minutes, until softened. Add a bit more olive oil if needed. Add the garlic and cook another minutes, until you can smell the gorgeous garlic. Add the browned pork along with the stock, potatoes, carrots and chopped roasted peppers. Here is what the whole pot looks like as it is just starting to get simmering. Bring to a quick boil, then reduce the heat and simmer for at least 90 minutes. 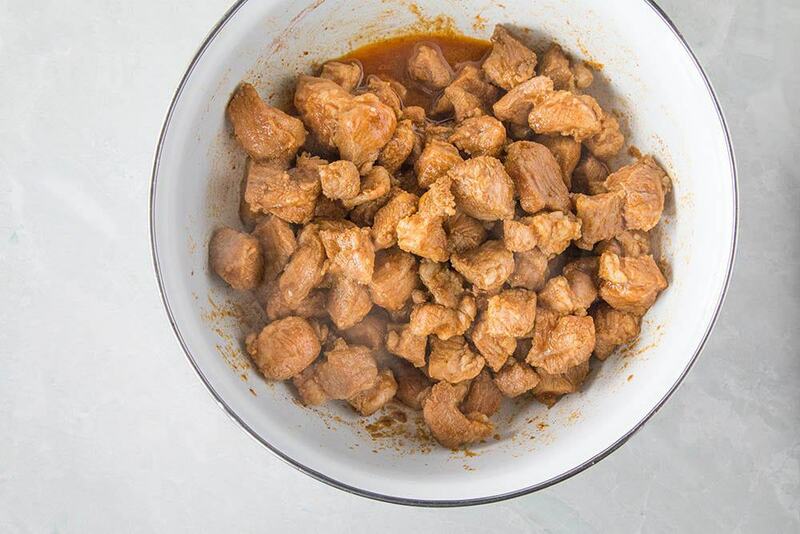 You can simmer longer to develop even more flavor. When ready to serve, remove from heat and swirl in the cilantro. Serve into bowls and garnish with extra cilantro. I like to toss on some fresh pepper slices and spicy chili flakes as well. As mentioned, I used green bell, cubanelles, jalapenos, and serrano peppers for my recipe because I enjoy the combination. The green bells and cubanelle peppers deliver flavor and body to the soup, while the jalapenos and serranos bring in a nice level of heat. Other green peppers to consider are Hatch chili peppers, Anaheims, or poblanos. There are many different options. Of course you CAN use red peppers for this, but then it wouldn’t be a “green” chili stew, right? But hey, go for it! Also, the longer you simmer, the better this stew gets. I kept mine going another hour to let everything more fully meld, but it’ll be ready in about 1.5 hours or so. 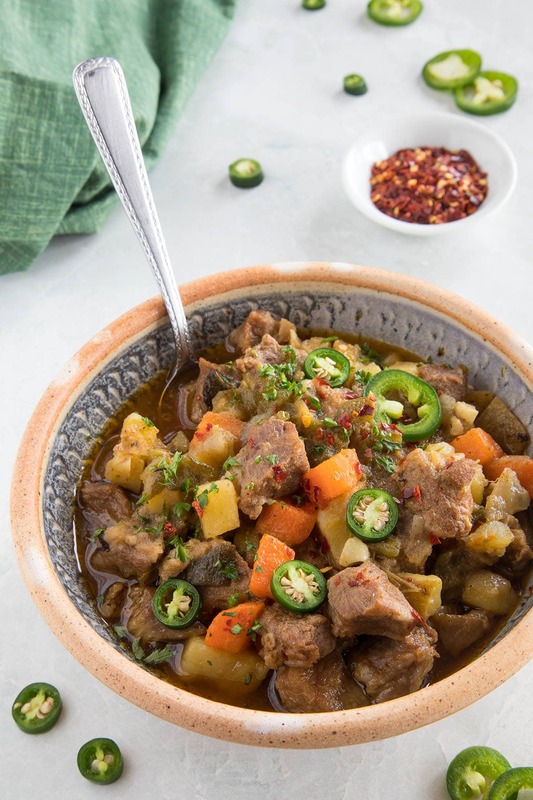 You can also refrigerate it in the cooled pot overnight to let the flavors develop even more, then reheat the next day for an outstanding green chili stew. That’s it, my friends! I hope you enjoy your green chili stew! Extra pork for me, please! Got any questions? Ask away! I’m happy to help. If you enjoy this recipe, I hope you’ll leave a comment with some STARS.Also, please share it on social media. Don’t forget to tag us at #ChiliPepperMadness. I’ll be sure to share! Thanks! 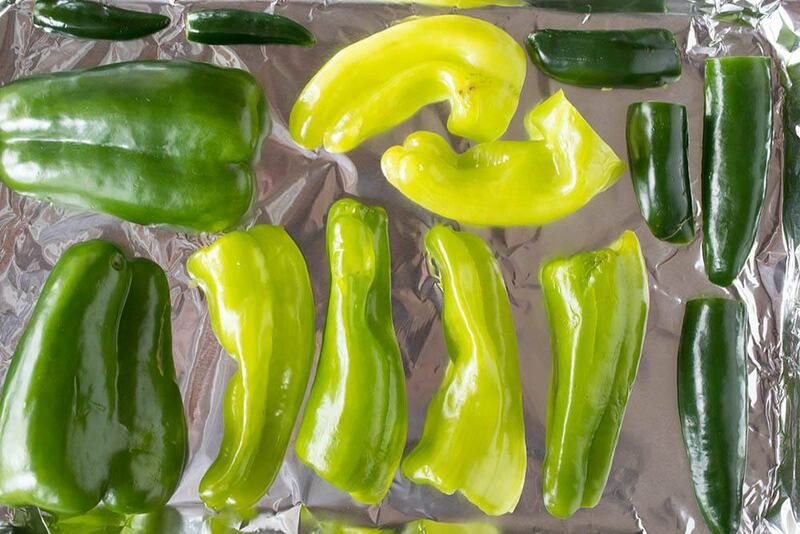 — Mike H.
Slice the peppers in half lengthwise and set them onto a baking sheet. Bake them at 400 degrees F for 20 minutes, or until their skins blister up. Cool them slightly, then peel off the skins and discard them. Chop the roasted peppers and set them aside. Add the browned pork along with the stock, potatoes, carrots and chopped roasted peppers. A variety of peppers with different heat levels will give a more balanced stew. I used green bell, cubanelles, jalapenos, and serrano peppers. Others to consider are Hatch chili peppers, Anaheims, or poblanos. There are many different options. Also, the longer you simmer, the better this stew gets. 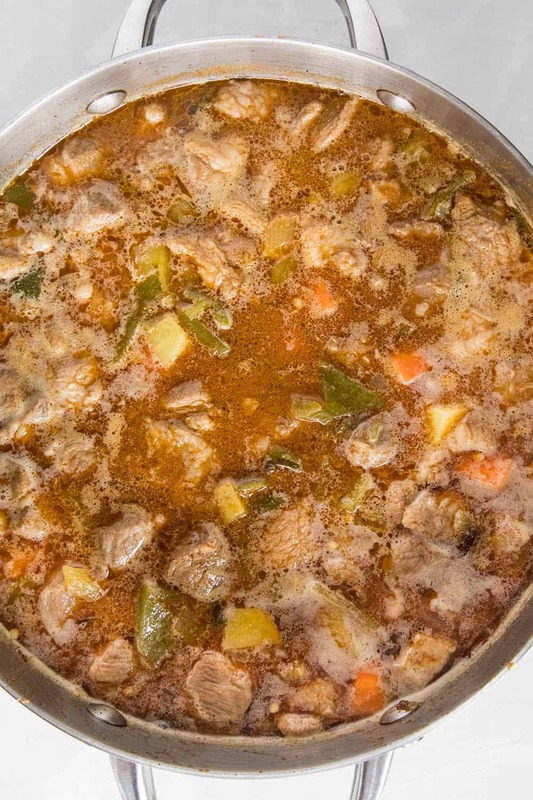 You can also refrigerate it in the cooled pot overnight to let the flavors develop even more, then reheat the next day for an outstanding green chili stew. Delicious. Oven roasting chili peppers is such a great way to add flavor. I love making chili with pork too. Yes! I agree 100%. Thanks, Jill! Now I’m dying to make this stew! I love spicy dishes and slow cooked stews so this recipe ticks a lot of boxes for me! Pinning this for our next cold snap. This looks so warm, comforting and tasty! So delicious and comforting! Perfect for this cold weather. Yes! This will warm you up for sure! It’s definitely the time of year for stew. Love how you roasted the peppers for this stew. I really like spicy so the hotter the peppers the better.